Wow, the last two days have been about water. Squirrels in my yard decided that my gutter downspouts were lovely walnut dispensers. They brought walnuts from the other side of the house to stack in my gutters. It was like a giant Pez dispenser for squirrels. Without gutters to give the rain something funner to do, it all ran into my shop. I have been moving water from one side of the shop to the drain on other side since yesterday. On a happier note, I got to play with the new draw-knives that my dad made me (see post just before this one). They flew through this poplar like butter. I am finding that I can rough out a carving like this faster and more happily with a spokeshave, hand plane, and a draw knife than with power tools. 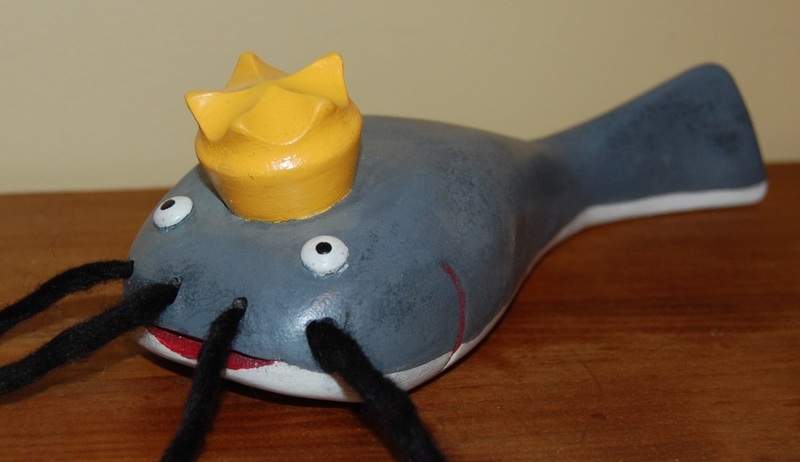 If you need King Catfish to swim in your pond, or to recite to you his heroic exploits, he will be available on my Etsy shop here. This entry was posted on May 21, 2010 at 2:53 am and is filed under Carving, Toy Making, Uncategorized, Woodworking. You can follow any responses to this entry through the RSS 2.0 feed. You can leave a response, or trackback from your own site.